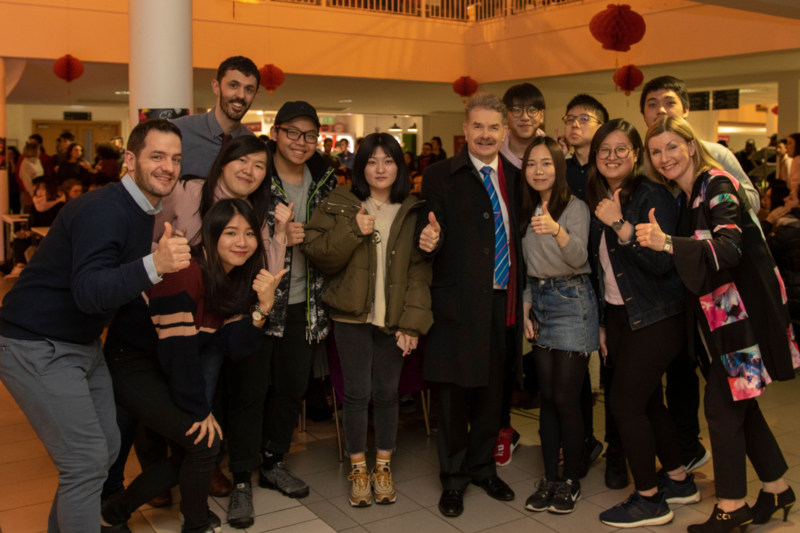 International Students at AIT celebrated the Chinese New Year on Thursday 31 January with more than 400 students enjoying Asian cuisine, music and dance to mark the Spring Festival, which begins on 5 February 2019. Each Chinese New Year is characterised by one of 12 animals which appear in the Chinese zodiac. This year is the Year of the Pig which occupies the 12th position in the Chinese zodiac and is considered a year for success and good fortune. There are 180 Chinese students at AIT during academic year 2018-19 with visiting faculty and researchers from Chinese partner universities. Members of the Chinese Students Society and Asian Society introduced their customs to celebrate the Chinese New Year to students on campus. Restaurant staff at AIT prepared a range of Chinese cuisine for students to enjoy. AIT has built long term relationships with Chinese partner universities in recent years in the areas of computer and software engineering, mechanical engineering, civil engineering, design, pharmaceutical science, hotel management, business and accounting. The universities with which it is associated are: Beijing University of Technology, Beijing; Capital University of Economics and Business, Beijing; Dongbei University of Finance and Economics, Dalian; East China University of Technology, Nanchang; Southeast University, Nanjing, Shanghai University of Sport, Luoyang Institute of Science and Technology and Jianghan University, Wuhan to name but a few. Academic staff from the Faculties of Business and Hospitality, Engineering & Informatics and Life and Physical Sciences has visited these universities during the past year to discuss study abroad programmes. AIT students who wish to complete placement or semester abroad can choose one of these partner universities in China. Programmes are taught in English and students will have the opportunity to become familiar with Chinese culture and business. One such example of a successful collaboration is with Jianghan University, Wuhan, Hubei Province for delivery of an undergraduate educational program for Graphic and Digital Design. Students have the option of completing their four years of Bachelor degree programme at Jianghan University (4+0) or transferring to Athlone Institute of Technology for their final year of Bachelor degree (Honours Level 8) programme of study. The first cohort of sixteen students transferred to AIT in September 2018 and are adjusting well to their new programme of study and life in Athlone. There are a number of business and educational links developing between Co. Westmeath and Hubei Province, China with the signing of an agreement of cooperation between Hubei Province and Westmeath County Council in November 2015. It is envisaged that educational and trade links will grow between the regions in the coming years.